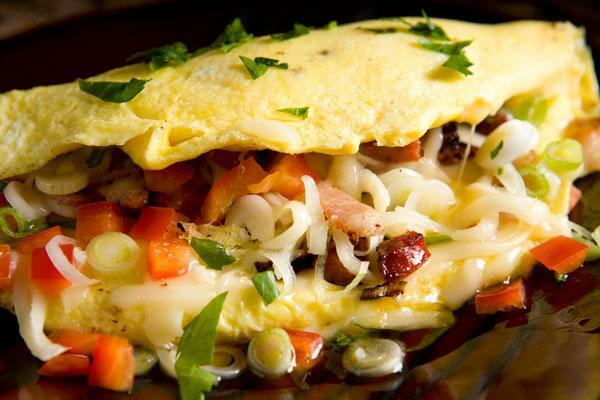 The day started with fried eggs and a liter of yogurt. Many great days in the past four or five years have begun that way. I don’t think it’s a coincidence. With my blood sugar controlled and some fat and protein in my stomach I made my way out to the lake for the start of the race. After pumping up my tyres and talking with everyone I wanted to talk to I still had an hour to kill. I sat myself down amongst all the commotion and relaxed prior to the start. 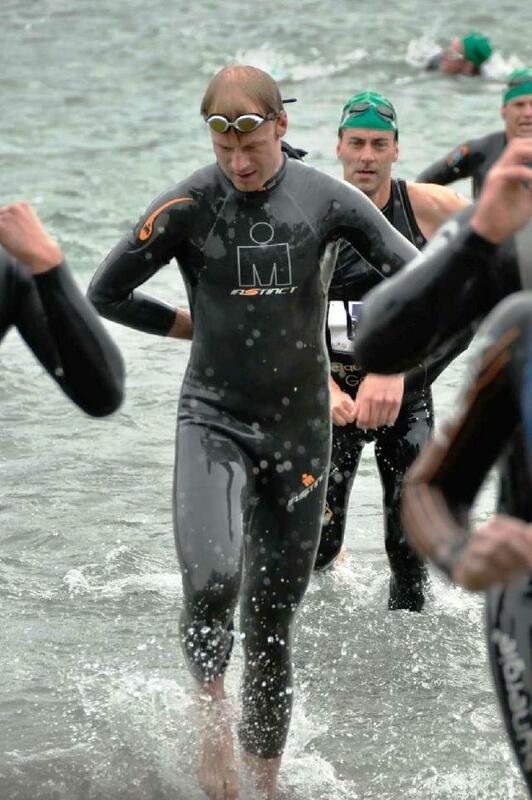 Eventually when I couldn’t see any other athletes who weren’t wearing their wetsuits I finally decided I should put mine on. We then proceeded to make our way to the beach and stood around for another 15 minutes waiting for the horn to send us off on our way. I had got myself pretty cold by this point with the lightly falling rain and bare-feet on the sand, and was a bit concerned but reminded myself that the water was plenty warm and I’d be fine once I got going. 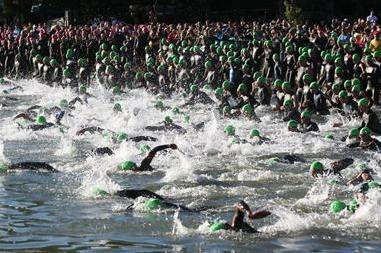 I started in the front row despite knowing I’d swim at least 10 minutes slower than the fastest swimmers that day. There were 800 people lined up and only 400 meters to the first turn and I didn’t want to be stuck in the melee that would inevitably result. I swam the fastest 400 meters I have swum so far in 2012 to start the race, and turned ahead of the vast majority of the commotion. I then proceeded to try and spend the next 1600 meters catching the drafts of the dozens and dozens of people who were passing me in the water. It sounds like a totally stupid strategy, but retrospectively I think I would probably do it again. It made for a very comfortable swim, and I never felt strained. I also wound up swimming quite quickly thanks in part to the fact that I was always in a good position to get a draft (i.e. amongst swimmers who are faster than me). Upon exiting the water I saw 36 minutes on the clock and was very pleased. 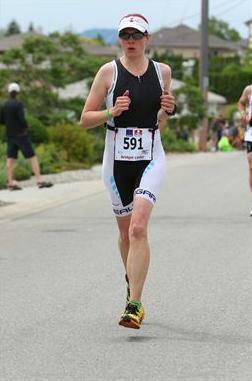 I was a bit of a zombie in transition, being quite dizzy, but I was soon on my bike and not feeling so bad at all. I lost my bottle of gatorade within 25 meters of transition when crossing a speedbump and navigating traffic that was employing typical age-group triathlon bike-handling skills. It was raining and only 10kms of downhill tailwind to the first aid station so I just pedaled on. I did the first downhill tailwind section of the ride pretty much as you would expect me to: fast! I rolled an average speed of 49.6 kph to the turn southbound. I was in love with life at this point, riding a bike very fast is pretty much my favourite thing in the world to do. Turning south I started to pick off a number of friends and team-mates many of whom looked calm and relaxed and enjoying their days so far. Turning west into the headwind I started to focus on head-position to maximize my aerodynamics through what would be a key portion of the course. 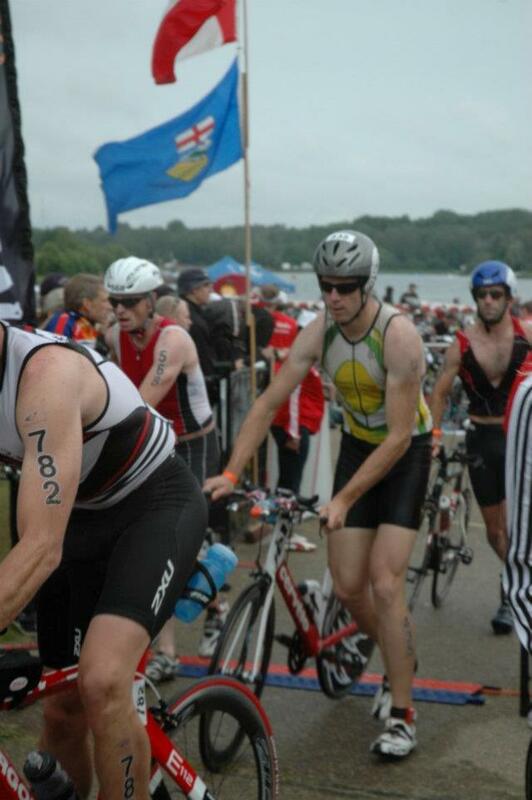 I had settled my heart-rate quite nicely after the swim and was ready to start cranking some watts. My legs were feeling good and I was on-target as far as I was concerned, the field was beginning to thin out quite significantly at this point and the people I was passing I was no longer ripping past. Then I heard a hissing in the rain and thought that my brake pads had started rubbing on the rim in the rain. I don’t know why, but when I reached down to try and adjust my front caliper my rear rim hit the road and I went a bit squirrelly, the hissing was gone because all of the air had drained from my tyre. I was very calm about the whole situation, knowing that my hopes of earning a fastest-bike-split-of-the-day-cheque had now gone out the window. There was nothing I could do now, but dose my blood-stream with too much adrenaline. Before I had stopped I already had the lid off of my tube of sealant and was going to try and be moving within 2 minutes. The sealant didn’t go in for whatever reason. Maybe because the whole thing was soaking wet, maybe because the sealant was a couple years old, maybe because it couldn’t go ‘around-the-corner’ of the cutout in my disc, or maybe just due to operator error. I had to do a full tyre change, Cam had now pulled up in the support vehicle and jumped out to help. I thought I was going to get a spare wheel from him but evidently he’d already given his spares away for the day because the wet roads were causing a ruckus for debris getting stuck to tyres. I had the new tyre out and it took some elbow grease and thumb strength to get the old tyre off before I could pop the new one on. Soon enough I was off down the road, but was going to be a pretty big chicken regarding cornering on the spare. The wet conditions meant I had almost no confidence that the glue would make a quick bond. Leaving the scene of the crime I had a low heart rate and was absolutely killing it for a while. This was a big problem, my lower back started to hurt and I had also got myself pretty chilled during the 9 minutes spent at the side of the road. 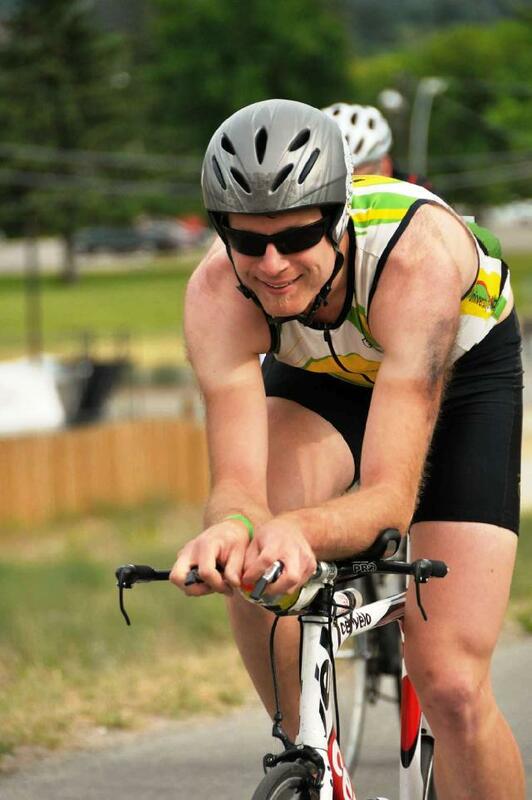 I had totally forgot what I was doing, namely riding a bike in a triathlon, and was trying to catch back on to the peloton in a road-race. It was a terrible strategy and when I realized what I was doing I was pretty mad at myself and then got really un-focused on the task at hand. 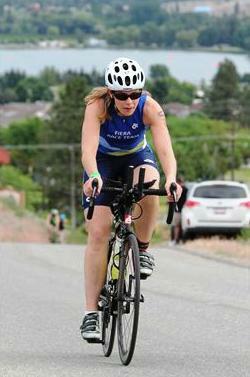 I had begun to then pass all of my friends and team-mates for a second time as I went through the river valley. Did I mention that I was scared for my life going down the hills in the rain on a poorly glued tyre? I was scared shitless and wasted a lot of free speed in the process. Coming out of the river valley the second time I started to regroup a bit from the thrashing I had given myself immediately after the flat and set out for the final 30kms or so back to town. I did an alright job through this section of pacing myself with a lot more restraint knowing that I had already done some significant damage. Entering transition I was feeling pretty disenchanted with the whole idea of running 21 kms. It was a good thing that it wasn’t until after the race that I realized how little running I had done in the lead-up to the race. 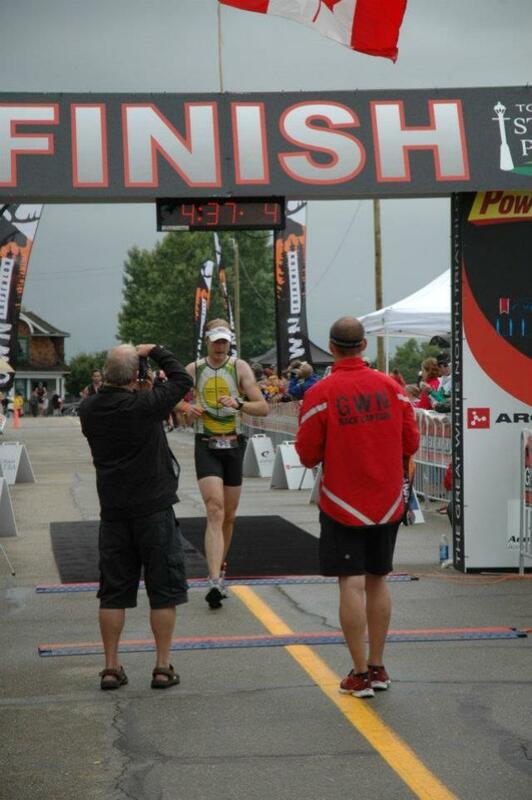 I had some sort of mental block or something because I had imagined that I had done pretty much the same lead-in to this half-iron run as I had done during my lead in to the Oliver half-iron run. I hadn’t. In fact, during the four weeks prior to this race I’d only run once, and only for 18 minutes. Naïvety was my friend, and I set out and jogged alright for the first kilometer, one of my better brick transitions in recent years. Then my lower back started to tense up and my calves started to really ache and groan. The lower back was directly related to my stupidity on the bike, and the calves were directly related to my lack of running. I was actually having a pretty fun time at this point. A large part of this was due to the fact that I had tons of energy and that the only things that were limiting me were muscles. I wasn’t very happy with things but I feel like I had an alright mood which was a vast improvement on where I’d been on the bike when I was being an idiot. It’s a lot easier to be in a good mood when you’ve got sufficient glucose to feed your brain. I jogged along for a while, mostly keeping it moving faster than 5 min kms. I was stopping to walk briefly at the aid stations to try and give my legs a bit of a break. I then found that I was drinking too much coke when I did this and eventually quit walking the aid stations because I specifically needed *less* aid. 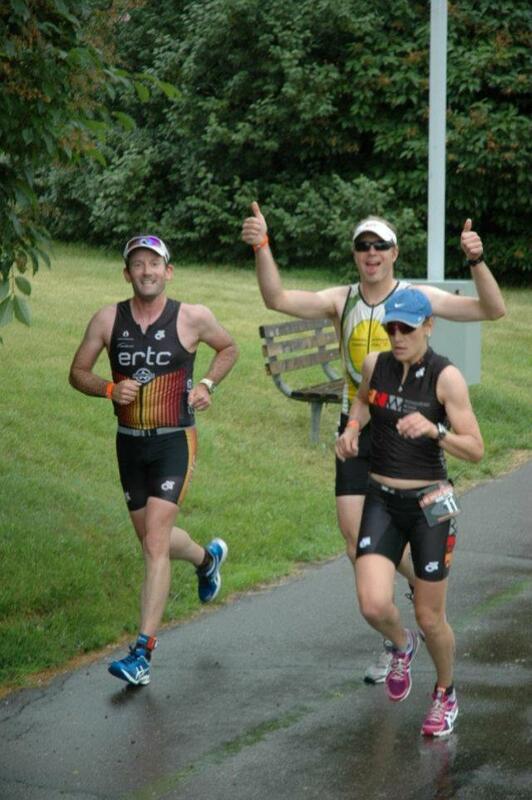 I stopped for a few seconds and stretched some muscles when I passed some buddies cheering on the run course. I also wanted to unload the CO2 cartridge that I was carrying. I waited up long enough to let Travis catch me and then we ran along together for a little bit. I couldn’t get my heart rate up at all, I couldn’t get the muscle recruitment to warrant it, and so I was fully capable of chit-chatting as we jogged along. Annett passed us here despite not moving like her regular self, and later Kris who was running well, showing off some serious leg speed and focus. As we saw the leaders coming back I felt inspired to do some crazy cheering because the rain was keeping most of the spectators away. It was down-right exciting to watch Stefan come by, I was almost 100% sure that he would catch Kyle Marcotte based on their proximity and how the two of them looked. I was slowly making progress along the course and wasn’t being passed by too many more people. There are some longish straightaways just before the turnaround which seem like things are spread out but it actually goes by incredibly quickly if you just focus on the running. As I left the turnaround I ditched my sunglasses with Ben and had a little bit of a headwind which cooled me down a little bit which was nice. The humidity was at 100% and running with a tailwind meant that sweating wasn’t really working as effectively as it should have been so despite it being around 15 degrees, I was getting hot. The tension also released in my lower back and I was able to pick up my knees a little bit. 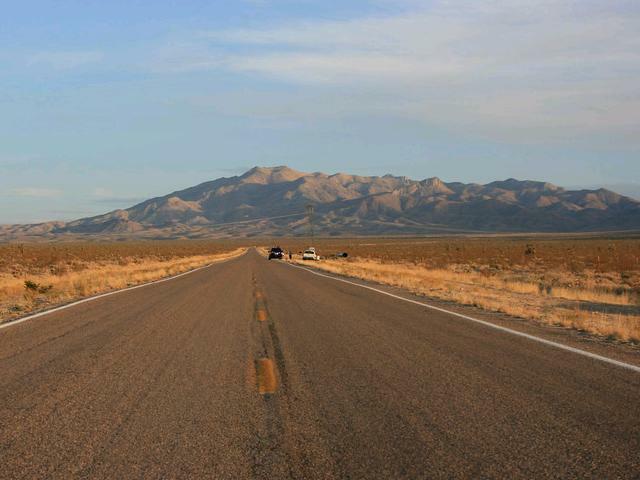 I started to lift my pace and set my sights on maintaining the gap to the people ahead of me instead of fading further. As I progressed along the course my hips and lower back opened up a bit more and I finally was capable of running. Once I could finally start accessing the muscles my heart-rate was able to come up and I ran quite nicely indeed. I started picking off the fading triathletes ahead of me and passed between fifteen and twenty during the closing half hour of the race. When I finally could run I made good time, my calves were killing me before I started running hard and my hamstrings really started to complain when I lifted the pace but I was pleased to average 162bpm for the closing stretch at 4:17 per kilometer pace. I was quite pleased with this outcome and pleased that when I finally did have an opportunity to get a race out of myself I didn’t just jog it in to the finish, but rather laid it on the line and went for it. The flat tyre cost me 9 minutes and 30 seconds when it should have cost me two. That’s mistake number one. Mistake number two was getting distracted by the flat tyre and making all kinds of pacing errors which proceeded to cost me relatively significant amounts of time on the bike, but more importantly the surging locked me up for the run. I don’t know how likely it is that I could have managed the 4:17 pace for the whole half marathon even if I had paced the bike properly, I would have been limited by my lack of running and my calves and hammies would have protested louder and louder eventually. Also, I wouldn’t have been able to access the ‘redemption’ motivation that I had to finish strong. ‘Redemption’ motivation may have been replaced by ‘competitive’ motivation if I was still in the hunt for a fast race, who knows, I didn’t have any of that on the run, that’s for sure. I didn’t have a PR in me at all by any stretch of the imagination (sub 4:14), but I would have easily been inside 4:25 without my mishaps, and possibly close to the 4:20 barrier. The 4:20 barrier is not just notable because it’s 4:20, or because Tim Clark’s race number was 420, but because it’s the threshold for qualifying to race as a professional. Eight guys did it this past weekend. Thanks to Becky and Lenka for the photos. 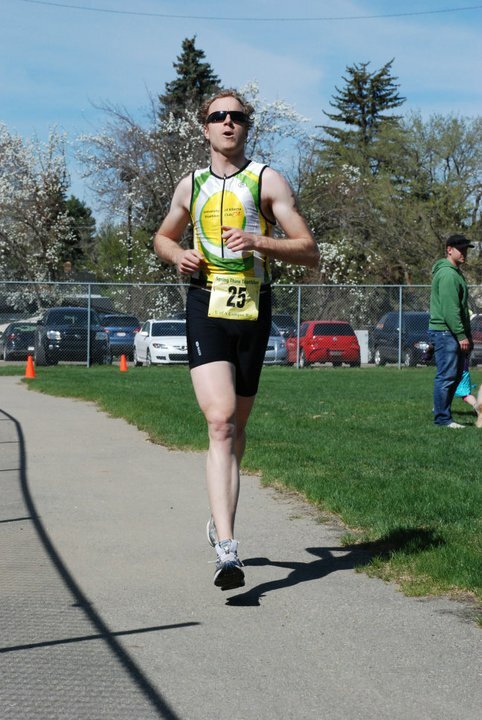 I raced the Oliver half this past weekend. 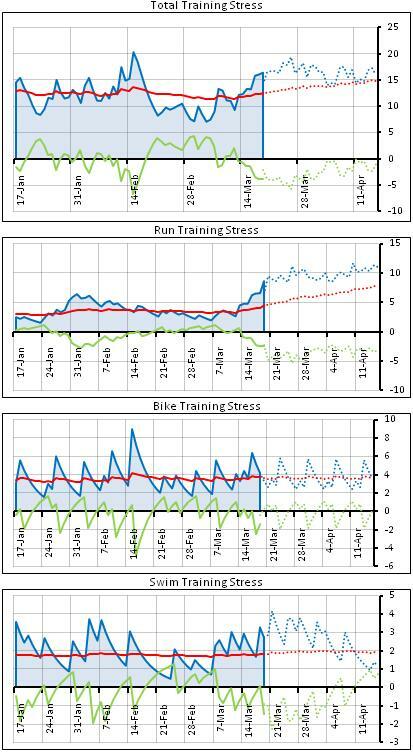 Preparation was essentially negligible with regards to triathlon in the prior three months. 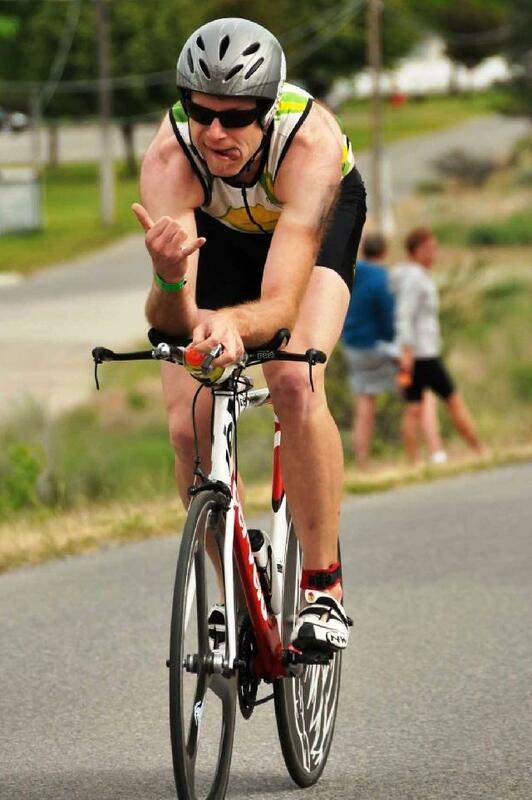 I have placed a focus on racing bikes and my limited training time has been focused on reaching the next level in road-racing rather than doing anything to prepare for racing a long course triathlon. I have to my advantage the fact that both sports are relatively endurance focused and I did run relatively consistently through the past winter. 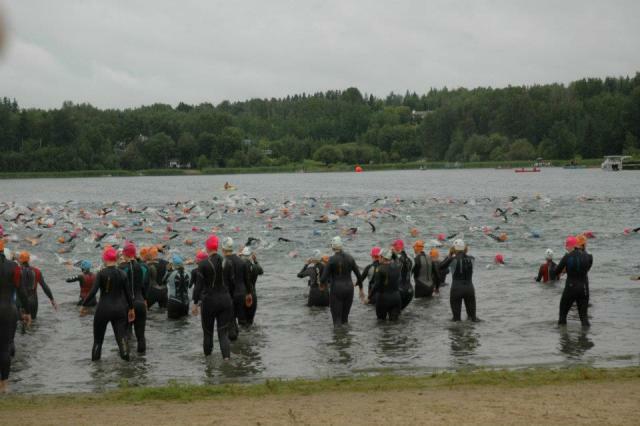 Swim training in the 100 days prior to the race included one 750 m swim during a sprint triathlon, and one early-morning open-water swim the morning prior to the race. Run preparation was on and off, but mostly off, it included a 10 mile run with Travis on the Monday prior where I felt like things were manageable between the 4:30/km pace and 4:40/km pace. I was racing with one data-point for HR and pace and hoping that extrapolations from there would be somewhat accurate. I found myself feeling slightly sick on Friday as the day progressed, and relatively sick on Saturday. 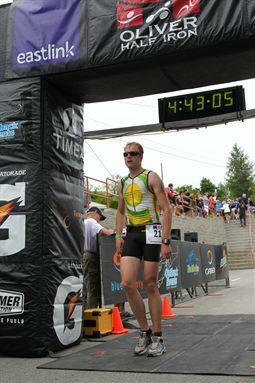 Sunday was worse again and my resting HR the morning of the race was 8 bpm higher than it should’ve been. I didn’t feel incapable of racing, and because I had used valuable vacation days to make the trip and incurred all kinds of expenses like gas and the condo, I never really questioned at least starting. Monday, post-race was my sickest day and I am now recovering slowly. Recover was delayed by too much time on Anarchist pass in the rain, or too many wineries, or both. Race day arrived, and after the requisite preparations I lined up ready as I was going to be on the beach. I was pretty calm about the whole thing, I was confident in my ability to perform alright once I got out of the lake and decided on an all-day strategy that should get me to the finish line as quickly as possible. Swim only moderately hard to conserve energy, two stroke breathing the whole way to stay comfortable and not risk getting out of breath. 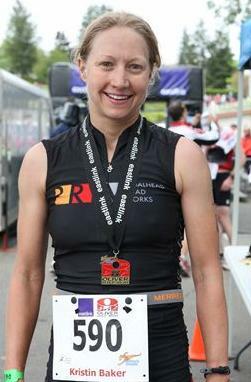 Ride a solid but conservative bike split that would enable me to recover from the swim, eat well and prepare nutritionally for the run, and then run as close to an even-split half marathon as possible, starting steady and seeing what I had in reserve during the closing stages of the race. I didn’t expect to find much left in the tank. The swim was relatively uneventful, I felt like I was overheating at the first turn and threw my swim cap onto a nearby kayak and continued on without a swim-cap. That was much better and I felt comfortable but tired during the closing stages. I pulled out of the water to hear Steve King announcing that the lead female had just exited the water. I estimated her to have likely swim 29 minutes, meaning I would have swum around 36 minutes. I believed things to be going quite well except for that I was tired. I wasn’t really sure how much traffic surrounded me, and fortunately I had no idea how far back through the field I was as that would have been demotivating. 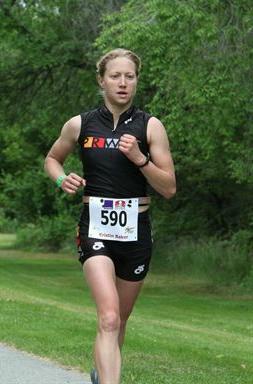 I opted to not run past anyone in transition and just go with the flow and try to get my heart-rate to settle. This wasn’t a fast strategy, it was a survival strategy. Jumping aboard the bike I had a target power target of around 300 watts. I knew that because I was sick I needed to watch heart-rate as well as power and be willing to adjust on the fly, after a half lap I had to switch my target effort to what I realized was actually going to correlate to around 150 bpm and backed off my target to hopefully average between 280 and 290, realizing that I’d either fade hard due to illness or more likely (because I was being optimistic), build through the last hour on the bike. 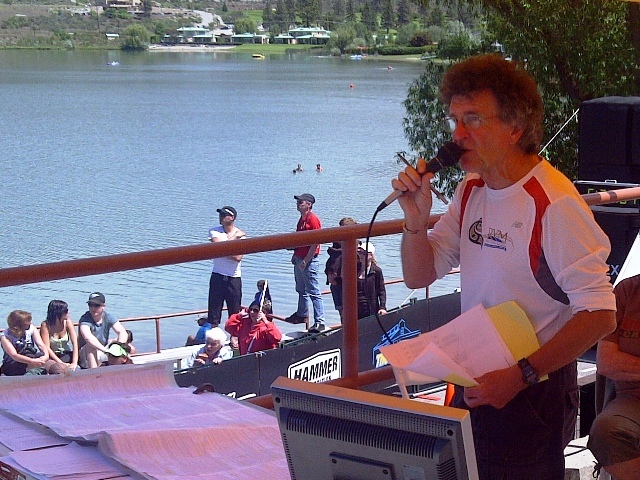 I got all sorts of conflicting feedback, some of it inevitably due to illness, and some due to poor swim fitness, as well as some due to the hair-raising experiences that inevitably occur when one has to pass nearly two hundred competitors while aboard the bike. I almost quit after a half lap, and then almost quit again after one and a half laps. I was a bit concerned about causing a severe chest infection if I really dug deep and got the lungs burning. Instead I just held back and kept going, I wasn’t really working very hard and so I figured I’d just keep cruising along. a spare tubular and CO2 cartridges. I have spent a lot more time riding and racing with my powermeter since racing Oliver last year at this time and was able to use it to strategically allocate effort a bit more effectively than last year. 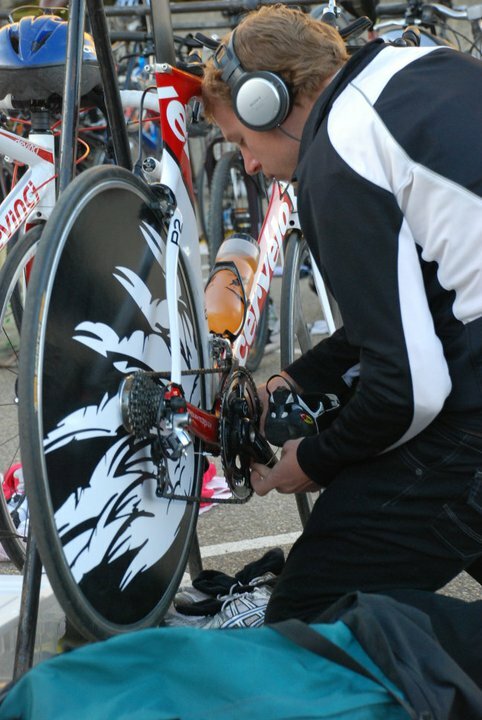 I am also riding a lighter and more aerodynamic bike due to a number of adjustments I made to gear and position. I eliminated the aerodynamic penalty of carrying a spare by storing it in an added sliced-open aero-bottle as a P4-esque fairing to the bottom of the downtube. I am also running no stack height between my aerobar pads and base-bar. I am also running 3T brakes instead of the outrageous stock vision brakes that came with all the old Cervelos. I made some adjustments to cable-routing which greatly reduced the effective frontal area of the head-tube. I also switched to “CeeGee” pads which materially absorb vibration rather than diffuse it. They allow me to comfortably rest a larger fraction of my torso weight through my shoulders to the bars which relaxes the upper body on narrower elbows and longer extensions. This allows me to lower my torso further without biomechanical penalty of inducing lower back stress or engaging upper-body musculature to support my torso. 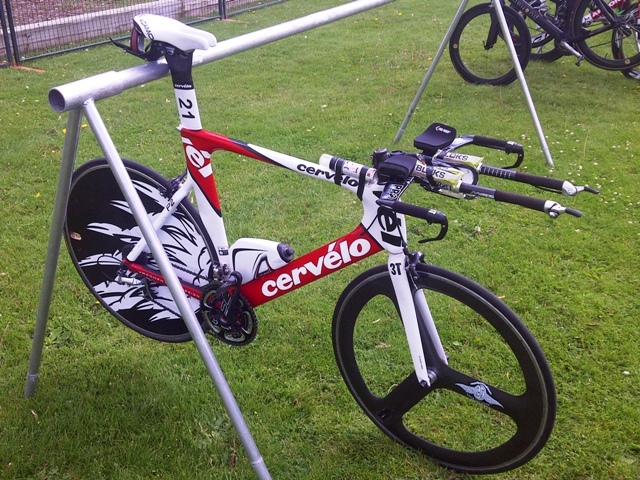 This is in contrast to my old position on the TT bike which was as low as I could go with that aerobar configuration. This position may also have been improved by adopting a slightly greater anterior pelvis tilt with an adamo saddle rather than a fizik arione. The pelvis thin is a guess not a measurement. I made those alterations at the same time, in concert they are an improvement and I cannot distinguish one isolated source. I am also more practiced riding this year with an improved head position, settled on through roll-down testing. This is a simple test that is worth perhaps a watt or three when averaged across the whole bike course. It’s one of the things that people should be learning from Fabian, DZ and Wiggins. Where you carry your head matters, even if it’s just for a couple seconds at a time. All together I was able to cover the course 153 seconds faster than last year while expending less energy: 284 Watts [avg] vs 298 Watts [avg], while being in better shape meant it was an even easier bike ride. 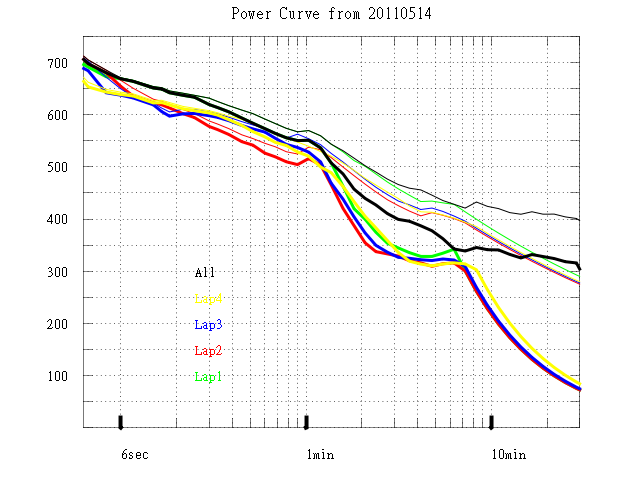 (training data suggests that 310 Watts [avg] would have been realistically achievable with good health). All of these improvements were of marginal financial expense; notably, I am still riding my P2 frame and second hand aluminum braking surface tubular tri-spoke and disc (circa 2006). Independent industry data doesn’t even suggest that if I were to buy a super-nine and firecrest 808 I would have made these gains. 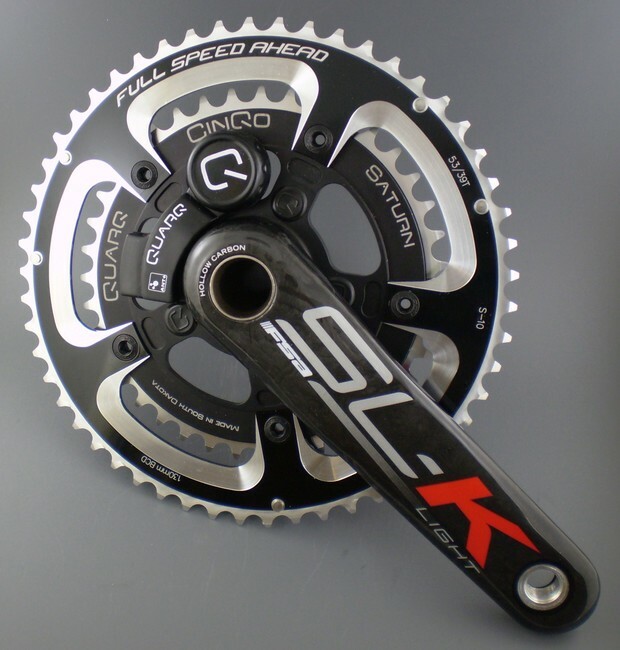 I saved almost 2% of my time and conserved more than 4% of my power output (Quarq is accurate to 1.5% and was re-calibrated prior to both races). Some of the aformentioned position and gear adjustment was saving me time but strategically superior time-trialing was worth a fair portion of the improvement, which is significant. Strategic riding is not something I see many people working on as hard as they could (or should). I don’t even think I’m that good at it yet (clearly I’ve gotten a lot better though). A detailed power comparison including a number of case-studies on pacing decisions will inevitably follow on this blog… stay tuned. On the bike I consumed: 1 bottle of powerade (~170 cal), 600 calories of shot blocks. ~120 calories of banana (2 halves), ~3.5 bottles of Gatorade (600 cal), and about a liter of water. I drank a fair amount and did pee once on the run. That put me at ~1500 calories which was more than I needed by a reasonable margin, but I was concerned about caloric expenditure during the swim being abnormally high. This concern was relieved when after the first 5 cups of coke on the run, I was feeling fueled and confident I’d make the finish without any risk of energy deficit. At that point I switched to alternating just a gulp of water or coke instead of drinking. Running with only marginal caloric consumption is a proven strategy for myself, it allows me to in theory run a higher HR on the run which is strategically beneficial. Those higher HRs weren’t accessed in Oliver due to illness and preparation that was lacking. Generally though, it felt like the right decision. I started the run at around 4:25 pace and faded off close to 4:50 as I began the second lap but was able to recover focus and really pushed myself through the final 4 kms. That led me to a 1:39:00 run. I did the calculations last year regarding course measurement and the correction factor for grading this to an accurate half-marathon. 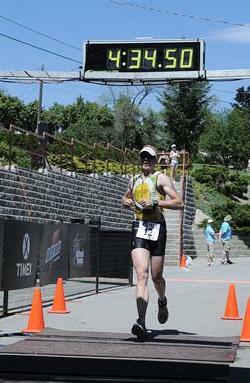 My graded-time based on pace is 1:34:44. Sub 1:35 is more than acceptable in my opinion considering run fitness and illness. Sure it’s 5 minutes off of where I should be and 10 minutes off of where I’d like to be but I need to be realistic about my life-situation at the moment. HR and pace on the run correlated more or less in line with what I had expected and that indicates I would just benefit from a bit of run frequency in the next month rather than any at-pace or above-pace work. Doing this will not require huge muscular-stress so I think it’s something I can try and commit to in the coming couple weeks as prep for GWN. Unsurprisingly the rest of the crew we travelled down with had pretty fantastic days on the course. Lesley exited the water in fourth and was riding in third overall until she was eventually passed by Kris who went on to win the women’s race by running 10 minutes out of the leader off the bike. Bridget surprised all, including herself, by escaping knee pain and was able to run the whole thing, something she was debating even attempting only days prior to the start. Travis tapered long and hard for this race, thanks to various business trips, but got around the course in fine form, more than redeeming the disaster in the furnace that occurred last year in the blazing hot conditions. How long was the swim? 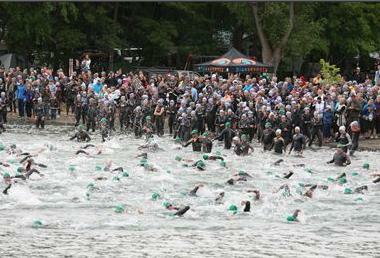 We have to presume that the swim course is on-average the length that is advertised (2km). 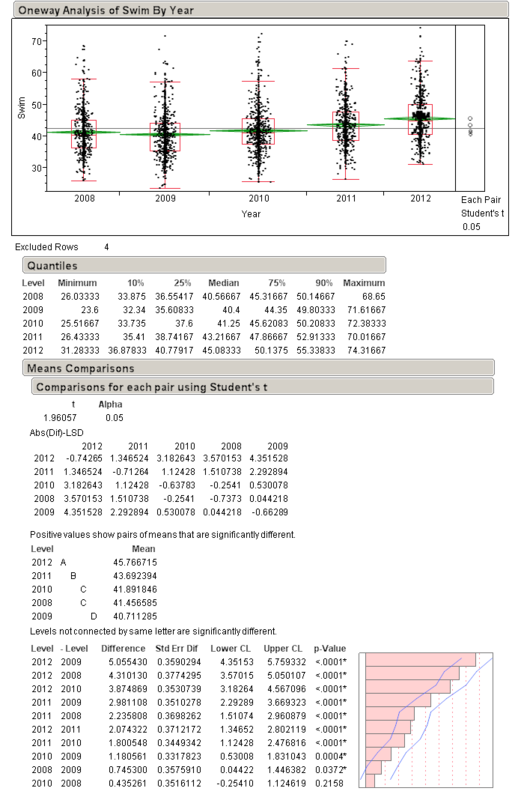 We also presume that the distribution of swimmers is equivalent from year to year. There is a confounding factor in that the prize money for this race has changed from year to year which may affect the depth of the elite field. 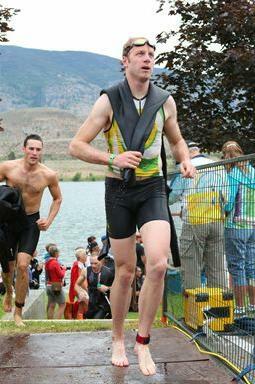 Without professional triathletes being designated as such in the results it is impossible to correct for this factor. With this year’s result we can change our assumption from last year as we are adding data to the all-time list, where calculations showed that the 2011 swim was likely 2085 meters in length. This adjusts last year’s likely distance to 2052 meters in length. It shows a likely distance for the 2012 race of 2150 meters, impacting the swim time of the average competitor by 3 minutes and 12 seconds. Pro-rating my swim performance chops off 2 min 53 sec and has me swimming a 38:30 which is lousy but not embarrassingly so, considering swim training consisting of one 750 swim during a sprint-tri and one 15 minute training-swim the day before race day and nothing else during the prior 100 days. 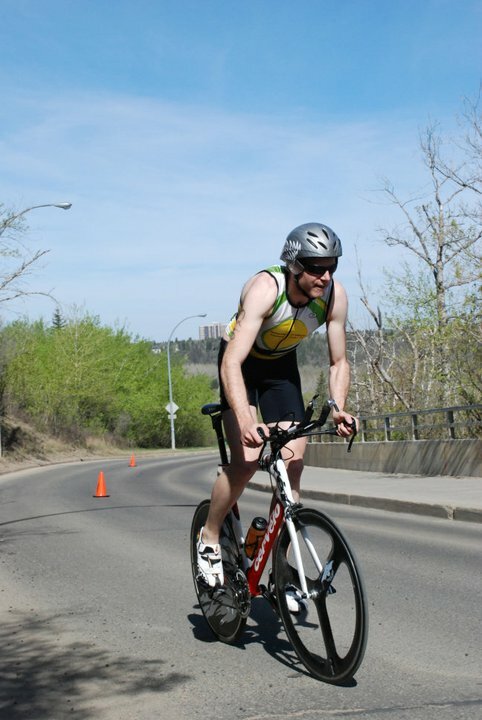 I’d raced the Spring Thaw Triathlon at the University of Alberta 4 times before and been the Race Director once. I’ve improved every single time I took on the course, and 2011 was my best effort here both in terms of physical preparation as well as strategic and mental preparation. I did few things wrong on race-day and made a bunch of good decisions that helped with my result. I’m really really happy with my execution of the race, and even though it wasn’t perfect, it was about as close as I think I could get to doing so. So, the fact that I won is great, but it took everything I had to do it. I may be showing a chink in my armour by writing about it now and publishing it on the internet for all my competition to read (because I have no doubt that Dave will be reading this each night before he goes to bed to take me down next time we go head to head! )… but so be it. 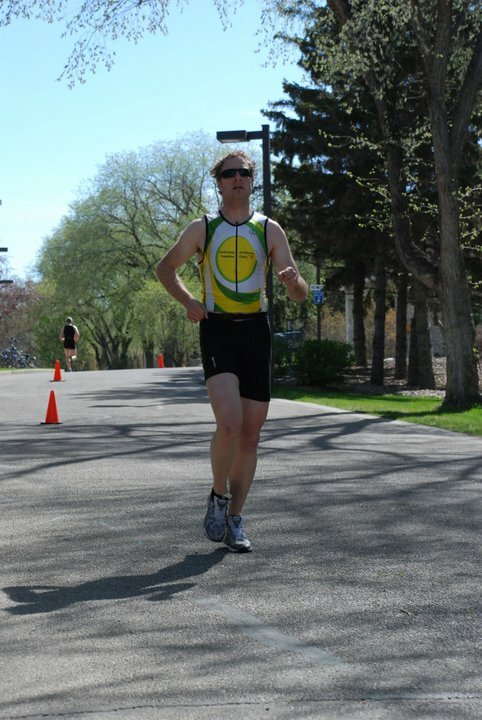 I was very close to perfect execution at the Great White North Triathlon in 2010 as well, that day panned out also very well and I thought a lot about that day while detailing my plans for this race. 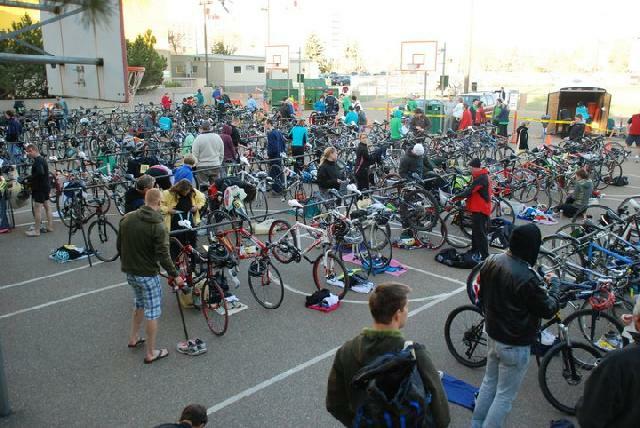 The Spring Thaw is a 750m pool swim in a 25m pool, heats go with 4 or 5 people per lane, this is followed by a 20km very challenging bike course with some sections of poor pavement, 4 ascents of Emily Murphy Hill which tops out at 9.7% grade (and takes about 1 minute to climb full gas), and has you navigate more corners during those 20kms than the average sprint triathlon, the run that follows is pretty straightforward and includes no hills but has a few sections of false flat. It’s an out and back where you should be able to see your competition once at halfway. This was altered on race morning due to a breakdown in communication and an underslept race-director adding an additional small out and back section meaning you’d see all your competition once and your closest competition three times. My good decisions began when I decided to call up Campus recreation and revise my projected swim time. I had quoted 12:30 when I registered which was an accurate projection of how fast I should have swum to pace the race correctly. I then heard via the grapevine that there were some ex-varsity swimmers registering for the race which would mean that the final heat in the pool would be filling up. I wanted to race head to head against the competition and not start in an earlier and slower seeded heat, so I revised my projected swim time to be inside 12 minutes, and quoted 11:50. I theoretically could swim 11:50 and so it wasn’t technically a lie, on the other hand I shouldn’t swim 11:50 if I had hope of riding and running well. That decision mattered, because when the heats were published it was only people who had projected to swim less than 12 minutes who got into the last heat. Everyone at 12min and more was in an earlier heat and therefore wouldn’t be racing head to head, it’s not that they couldn’t win, but it would be impossible to ‘race’ other heats. My next set of good decisions began with a focused race week. After a very disappointing finale to my marathon buildup this spring [I wrote about that here] I decided that I needed a redemption performance ASAP. 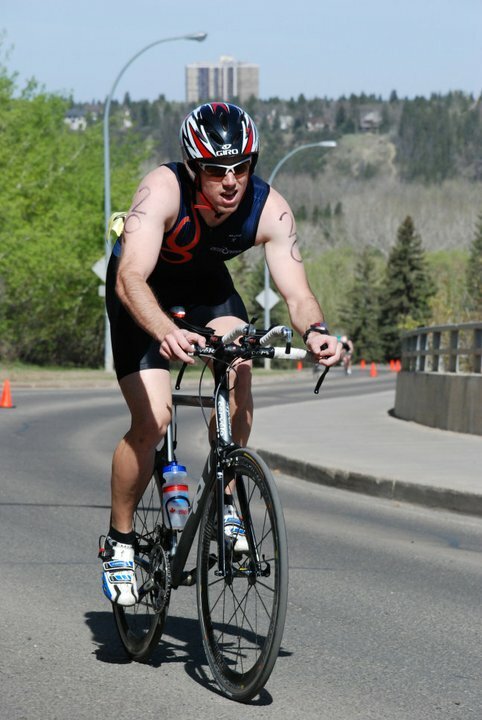 If I had raced well at the marathon this triathlon was going to be fun, I’d race my best but I wasn’t going to go out of my way to sharpen up for it. Instead of training through it, I felt like I needed to show myself that I was capable of good execution and strong mental racing skills. So race-week workouts were done with this in mind, meaning I didn’t go and ride 500kms, I didn’t skip all the swims to be outside in the first nice weather of the year, and I didn’t try to push my run volume back up above 30 miles per week in preparation for the Oliver Half Ironman. I swam long the previous Saturday, swam Monday and ran short, ran and swam Tuesday, did a race-effort 15min (powercurves at right) with some transition practice on the bike to ingrain the pacing strategy for the big hill in my mind and muscles, and then ran and swam Thursday with a rest-up on Friday. While nothing impressive, that’s more swim frequency than I’ve done since before Ironman, I was committed to getting the feeling of being a swimmer back in my arms. I was successful with that. Race morning I had one goal in mind which was to stay calm. This was all I focused on at GWN2010 on race morning and it really helped. I arrived early to get a good spot in Transition, kept the headphones on to keep distractions at bay (which was more a sign to other people that I didn’t want their distraction than for the music) and once things were set up I tried to stay away from big groups of stressed out triathletes. I parked myself in the stands at the pool and tried to be calm. When I heard that the run-course had been changed on a whim on race-morning I was pretty frustrated, as I had personally invested about 3 hours in accurately measuring a run course for the race to be exactly 5.00kms and there was no reason for it to be changed on race-day. Instead of trying to fix it I just watched the giro broadcast online with Travis. I was pretty sure I could run 5.8kms at the same pace as I could run 5.0kms so it didn’t really matter. No warm-up swim. This might not always be the best idea but for now, I think this is my best strategy. Getting into the pool and swimming around to get warmed up just gets me thinking too much about doing this and doing that. If I just start swimming and focus on getting the pace to match the kind of breathing rate I want I find that I can manage better than if I am thinking about stroke mechanics. A warm-up swim is just going to get me thinking about stroke mechanics, so I sat on deck while 100% of the other athletes in the final heat (who had all quoted swim times faster than me!) were doing their warmup swims. 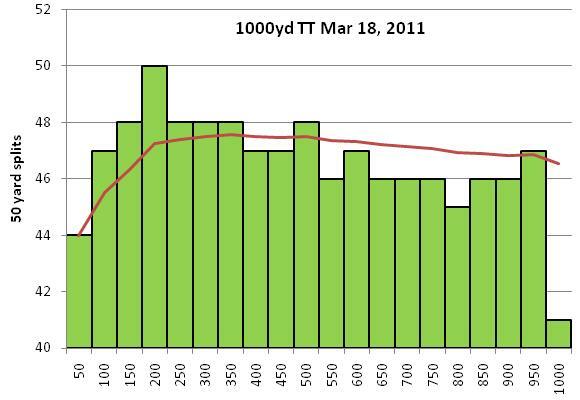 I visualized T1 instead and did some shoulder circles and kept my HR down. Exactly like GWN, I just waited on the sidelines until I had to go and get ready, when I did jump in the pool I was calm and ready. 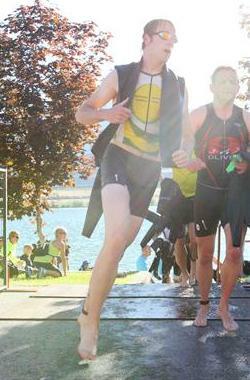 The swim is my weak-leg in Triathlon and so I really wanted to cut my losses. I needed to swim my best in this race if I wanted to be in with a shot at running near the front of the race on the run. I had swum with 2 of the 3 other guys in my lane frequently this past winter and I knew they were strong, I also knew they were going to go HARD off the start. So, if I wanted to catch their drafts I also needed to go hard off the start. I did. It took Travis a full 100m to catch Rob’s draft after the 5 second staggered start. It took me another lap to catch on to Travis which was like bridging about 8 seconds up to Rob considering I was still 2 bodies back. By the time we were at 200m Rob had really detonated and let Travis and I past and he tacked on to the draft train at the back. Brian, who was leading our lane went even harder out of the start and we missed catching his feet for the swim. I followed Travis for 150 more meters and recovered as best as I could from our crazy fast start at which point Travis was starting to fade and I gave his feet a tap and he moved over. 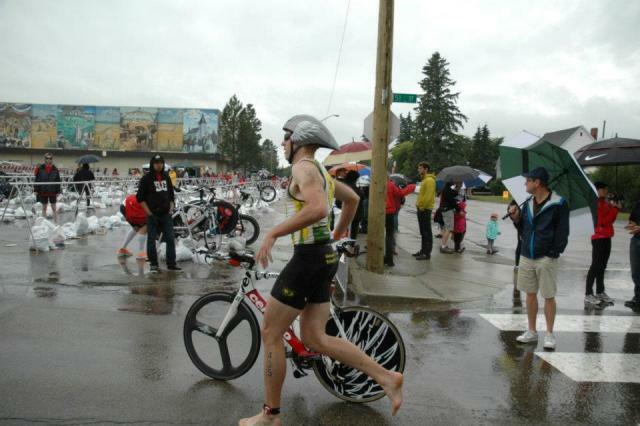 I made sure that he and Rob were going to catch on to my feet for the draft for the rest of the swim and went hard for the final 400m to finish it up. They’d helped with the fast start and so I felt like I should contribute back by making sure they’d have a draft to finish off well. I maintained breathing every stroke for the final 400 which means I’m going hard. I maintained the gap to Brian up at the front of the lane until 650m and then even pulled it in a bit on the last 100 such that in the end I actually outsplit him as well. It was about as fast a 750m as I think I’m capable of and I hopped out for a 12:01 time. That’s equivalent to 1:28 per 100yds, which I’d be hard pressed to pull off in a set of 100s in the pool during practice! There were 25 people in the last swim heat and I swam the 22nd fastest swim of the day with one person from the second fastest heat swimming faster than me, that meant I was the 5th last person out of the pool… so my significant planned underestimate of my time to try and get me into the final heat of the day was not a strategy that I employed all by myself, there were other people out of their league as well! T1 was fast. Helmet, racebelt, go! 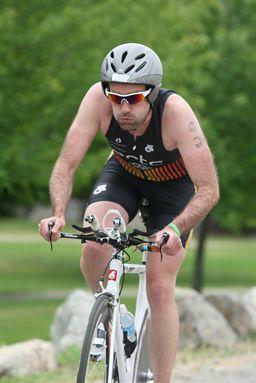 I saw Dave in T1 and was on the bike ahead of him. I caught a couple people right away, I caught a group of the varsity swimmers pretty quickly and I caught Mike Downey on my ascent of Emily Murphy hill the first time. Retrospectively I think he was in the lead of the race at that point. I’m not sure if he realized that. After that I had a few people to pass here and there but for the most part I didn’t have to lap much of the field while on the bike so traffic was never crazy. That description of the bike leg is purely from the outside. On the inside I was hurting. If I were to have swum that hard for a 750m TT in swim practice I would have crawled out of the pool and lay on my back on the deck for at least 10 minutes. I might have eventually recruited the energy to flop back into the pool and do a couple laps to cool down to prevent my body from seizing up into one big cramp but I wouldn’t have been able to do any more of a workout. 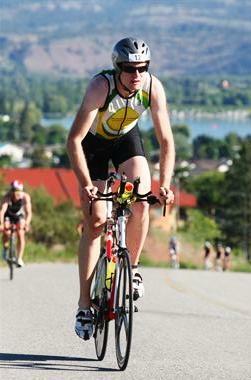 Instead of laying on the pool deck I transitioned into the bike leg. Needless to say I was a bit lacking on power. 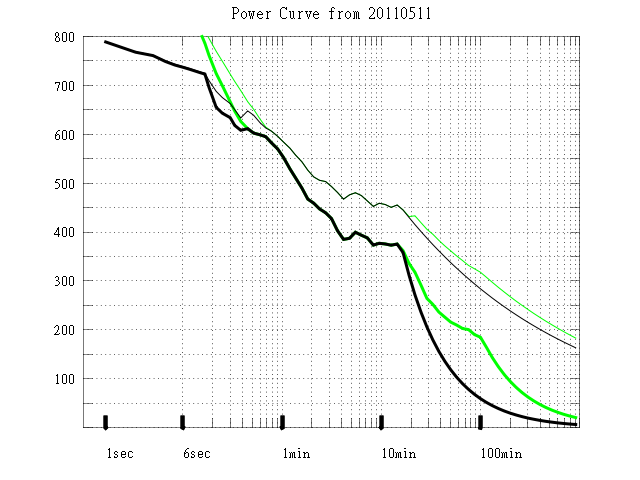 The power curve way up above is from the little pre-race workout I did on Wednesday on the course. I had an Average power of 358Watts & a Normalized power of 445Watts for 16 minutes or so. 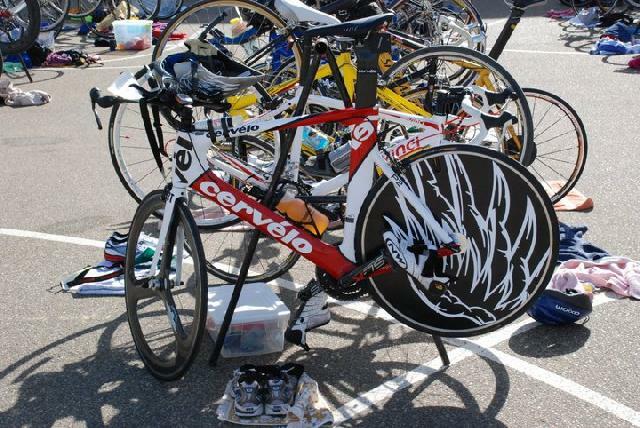 It felt controlled and reasonable for race-day. 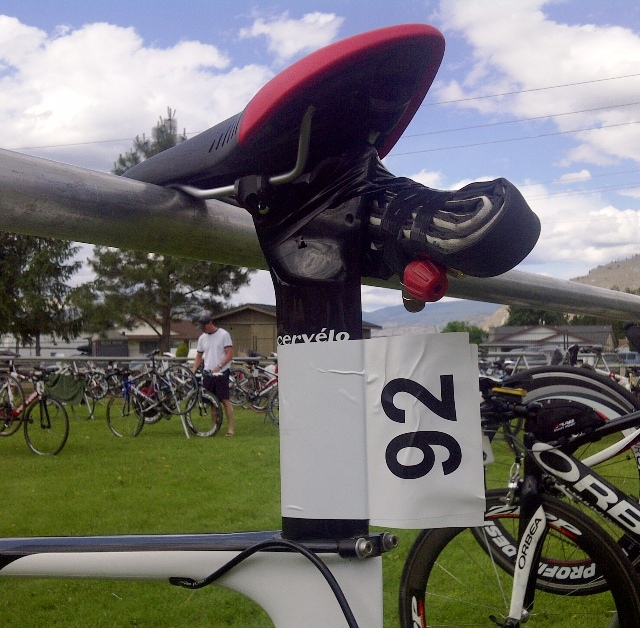 Instead my race-day performance was 311Watts Average power and 399Watts Normalized power. About a 10-13% slump from where it should have been depending on how you look at it. It was partly that I couldn’t bike as hard as I thought I should have, but partly I made a decision that I needed to be able to run. It was a wise decision and I’m proud of myself for deciding not to bury the hatchet before T2. I rode strong, strategically used my effort where I needed to, and did my best to arrive into T2 in less debt than I had arrived in T1. I still netted the fastest T1+Bike+T2 split of the day. It was also a course record, it was strategically suboptimal and I was OK with that. Exactly like Great White North, strategically slower than my best, and arriving at T2 ready for a footrace. I wanted to be able to run with the freedom to choose my pace based on what felt right and so elected to go without a watch, I didn’t want feedback I wanted to run fast. Leaving T2 I felt good for 400m and felt rough for about 800. The first out and back came at this point and I saw Dave behind me, I had no watch and didn’t bother to try and figure out any split. I knew that if he was going to catch me it couldn’t be until the second half of the run. I lost a fair amount of time through that rocky section but focused on my footstrike and my breathing for another kilometer and my legs started to improve. 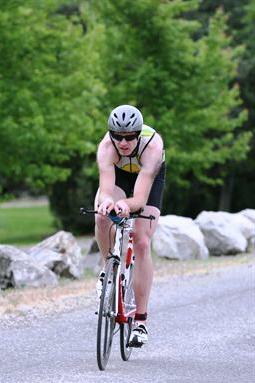 I then turned into the headwind and I really picked up my focus. I am good at running into a headwind. Whether or not anyone can quantify that… hmm… I don’t know. I always mentally decide that it’s advantageous to be running with a headwind when you’re a heavy guy as it can’t blow me around as much. In any case, I felt good for a fast kilometer into the wind. Then the turnaroud. I got to see Dave again, he had gained on me but not by much, if he was going to catch me it would be less than a kilometer from the finish. I was now running with the tailwind and felt good. I think I’m also a good tailwind runner, I’m like a sail. 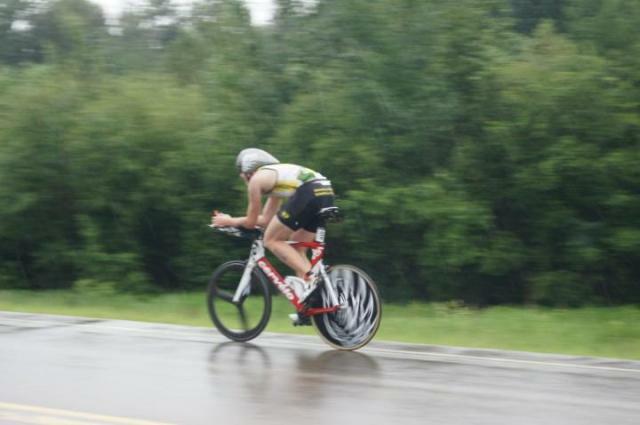 I guess I should always race on windy days, I’m mentally strong in those conditions. Things ticked by and I realized I was within 10 minutes of the finish. I can do anything for 10 minutes I told myself. Just like GWN I had paced the run so that I felt amazing with about 1/3 of the run leg remaining and then really let loose. Then with a kilometer to go I told myself it was only a kilometer. I can do anything for a kilometer, I hadn’t checked over my shoulder all race and if Dave suddenly appeared he wouldn’t have had a chance to pass me. I was ready to go for the finish at a moments notice, I had my running legs now. I refused to check back and see where he was, if he saw me look he’d have hope and I wasn’t going to give it to him. The final little out and back and I could finally have a look. He wasn’t nearly as close as I thought. Just run I told myself and so I did. There were a few cheers as I came around the side of the building and I was feeling awesome. The lap on the track at the end was really great and it felt totally fantastic to wrap it up like that. Every race should end with a lap on a track, it’s a great feeling. Lets take some notes from Paris-Roubaix and the Olympic Marathon. 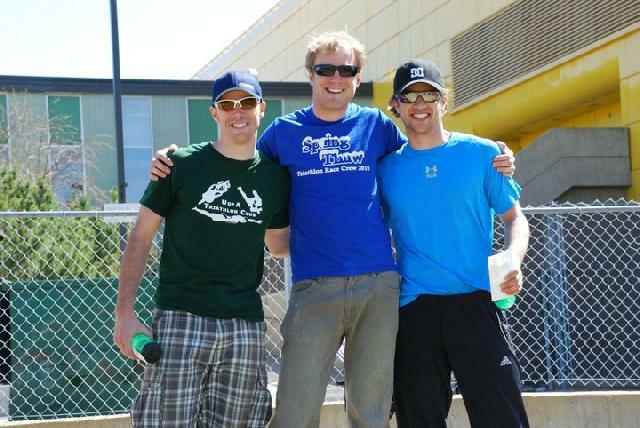 Mens Sprint Podium – a UofA Triathlon Club clean sweep! Thanks to Keegan for the photos! I had a bit of a washout for the first week of this period, it could have been good training but then I went Telemarking for two days. It was fun, but it killed three planned runs. Sure I logged lots of hours but Telemarking is pretty non-specific preparation for a marathon, at least it uses your legs I guess. That trip also hampered the next week because I should have been working on the revisions on my thesis demanded by the examining committee that weekend, but I went skiing instead. They needed to be done the next week and so I botched another opportunity to do some high quality consistent running in alright conditions. The next week I travelled to Calgary to attend the funeral of my Grandfather, and then started work. While that didn’t force me to take 4 days off, run once and really come off the rails with training, I don’t see that I necessarily should have done otherwise. Death is a motivation sucker, it always will be and that’s just how it’s going to be. I actually don’t really care that that week was a write-off, but I am frustrated that I started to slide in the two weeks previous. It’s a good thing Dave demanded that I come out and go skiing the following Sunday or I would have skipped out and taken another zero. The next week back took some getting used to, I had slipped a fair amount in my consistency with everything and it really felt like I was trying to get a heavy locomotive rolling again. It seemed that the whole metabolism managed to slow itself down and needed some time for the pressure in the steam chambers to build up before I could roll out of the station. I did get moving by the end of the week but was frustrated by the fact that my well laid plans for preparation for this upcoming marathon had been all-but destroyed. Part of me wanted to give up, it was a large part. I asked Dave what I was supposed to do when I just didn’t care about a race anymore. It wasn’t like I was asking if it was OK to switch to the half-marathon, I was wondering about quitting all together. 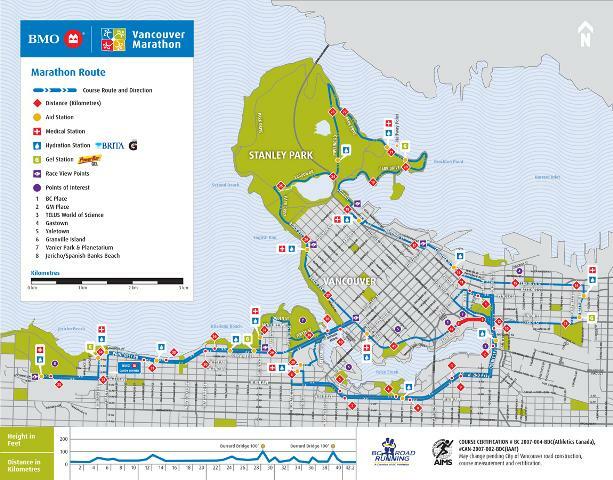 Maybe I’d go to Vancouver and just be a tourist for the weekend with that plane ticket I now wished I hadn’t bought, maybe bring a bike and write off the whole idea of running a marathon. Then I got roped into a long run that evening by Keegan and went along with it. I stand by the statement that I’ve been making quite a bit recently. “If you’re smart about who you choose to surround yourself with, peer pressure only does good things.” I tapped out a 1h49 half marathon and stayed strictly aerobic for the whole thing. Decked out in full tights and jacket, running in loose snow and doing some single-track trails… that’s a totally amazing time. It was at this point that I drew the analogy that I was the big locomotive that was taking a while to get going after a lousy three weeks of training. Hindsight helps. I figured that my best bet was to try and put together a good week of training, keep it mostly aerobic and then see where I was at before I made any drastic changes of plans. The last week of training went well. I didn’t roll over 20 hours or anything that would have seemed super impressive last year during the Ironman build, but I did run with good consistency and put together some pretty good runs, nothing junky. Everything had a purpose and I was happy about it. It wrapped up Saturday afternoon with a good long run of 30kms with a 5 mile section thrown in after 30kms where I was able to maintain a 7:22 pace in variable snow conditions. I got home feeling beat up, but happy. I think it’s a real positive sign to feel like the marathon training plan is back on track. 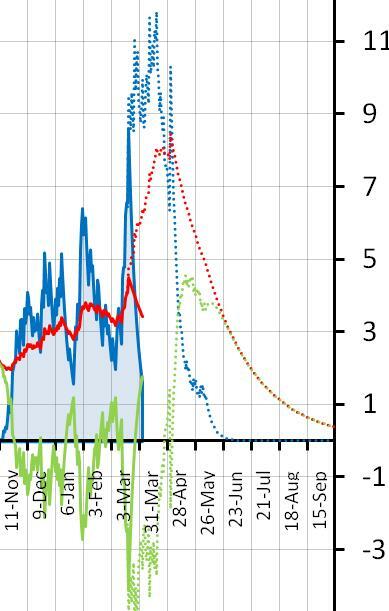 Unfortunately it’s not really, there is a pretty significant hole in the middle of my buildup (as evidenced by the falling CTL [red] on the chart at right). I have modified the plan from here on out to account for this. I’m cutting the amount of running above aerobic threshold scheduled for this coming week in half. I’m also cutting out all of the VO2 focussed intervals that the Pfitzinger plan has scheduled in favour of strides and some running just slightly above marathon pace. I’m trying to be conservative with what I can ask my body to do without as extensive a base-buildup as I should have done. I’m then paring back the total volume anticipated by 10-15%, slicing it off of most of the runs with the exception of my long runs which need to stay at the higher durations as they are needed for focus on duration. The marathon on May 1 didn’t get 10-15% shorter. I’m posting the planned weekly schedule from here to the race [here]. It’s accurate for running, and if the weather co-operates I’ll be adding some aerobic cycling to the mix once the roads are clear. There’s not going to be stress on the muscles in my legs for that kind of stuff so I’ll sprinkle in what I have time for. For completeness sake I’ve included the PMCs for all three sports and my total at the left here as well, click on the mini-picture to expand. Finally, I have one other stat to note… I swam a 15:31 for 1000 yards on Friday. I went out pretty conservative in the first half. I think that partly had to do with me not really wanting to suffer as much as I could have suffered for 15 minutes but also a bit of disillusionment with the purpose of doing this when Keegan had opened up with a 1:15 1000yds next to me and I was feeling super slow. I did turn it around in the second half which is nice and it made for a good workout even though it’s evidence that it wasn’t the best test of my actual 1000yd TT speed. Despite being a long ways off how well I was swimming last march at this time this is a huge improvement in my swimming since Christmas when I was struggling to come in with 50 second laps on only 100 and 200 yard intervals in a workout. I’m also happy to report that I’m actually tackling flip turns with some regularity. 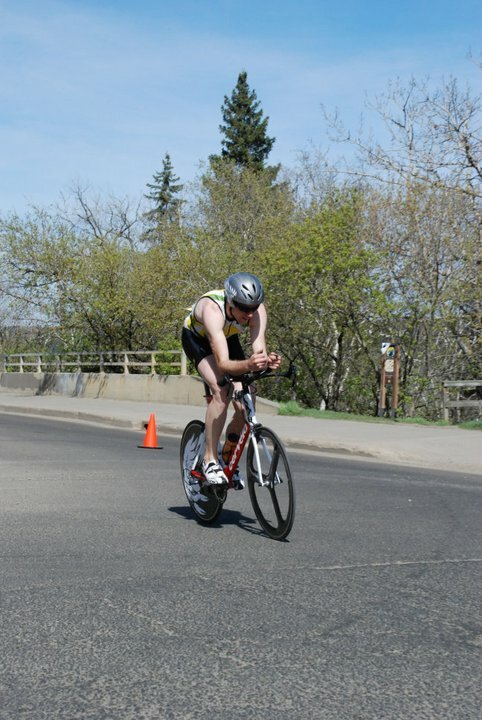 The immediacy of the Spring Thaw Triathlon, where successfully doing flip turns could amount to a full 0.5% improvement of my finish time has convinced me that it is worthwhile. Buying carbon aero widgets to do that would cost me between $1000 and $1500.